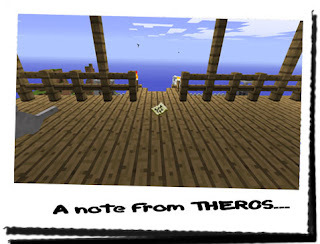 Diary of a Miner: Day 61: "Unfinished business"
If THEROS was still right about something being hidden, maybe I would have to make use of the other resources available to me. 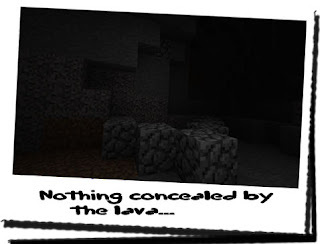 After returning to the pit, I took out the stone and held it slightly in the cover of a overhanging tree to determine if it was emitting any light. After a few moments of squinting at it, I came to the conclusion that whatever was left here wasn't related to a portal; the stone would be shining bright yellow if it did!I put the stone back in the bag, and went into the centre of the pit. It was then that I realised something... The cage... It had still been here yesterday when I pushed the Creepers back, into the portal. But now it was gone... Was it still there after destroying the portal? I don't know, I hadn't checked! I was too concerned about the small lava pit and ensuring I retrieved the stone to care about the cage! Where had it gone? It couldn't simply get up and walk away... Maybe the cage was connected to the portal... Maybe that's where it originated from, and was destroyed by the rift was the portal collapsed! That had to be it! It didn't really matter; I didn't know what they were anyway, just that they appeared in the most random of places... One down in the mines, another in the dig site, and the first a few weeks ago near the forge right on the surface! Pushing it from my mind, I took the note out of my bag and re-read it... "Search for that, which is hidden in plain sight!"... Looking around, I couldn't see anything that could hint at that. I was probably thinking too literally, trying to imagine something literally hidden... That wasn't helping me at all... I looked back at the hole where the portal had been, assuming it was linked to the portal somehow, but I couldn't see anything... The only notable thing was a small patch of cobblestone set into a wall of dirt... Actually... The more I thought about it, the weirder and weirder it seemed... 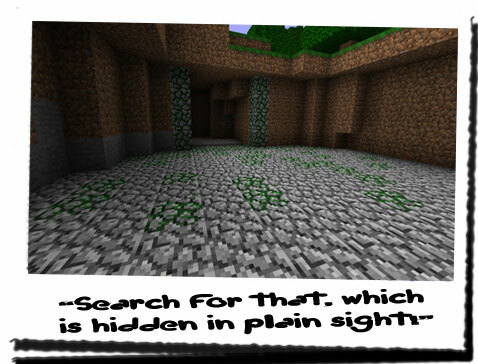 The pit floor was composed of cobblestone, with traces of mossy leading to where the portal had been! 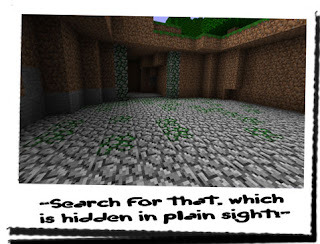 But behind the portal it was all dirt... Except for one small area... Approaching it, I noticed it seemed a bit loose, and wasn't set into the wall properly... Setting the bag down, I began tugging at small parts of the cobblestone, with it coming apart in my hands. I continued tugging until I was practically digging it out! Then my fingers went through a hollow patch, and I used it as leverage to pull the rest of the cobblestone free... What was this? In a little hole in the wall was a lever... I didn't know what to do; I was a bit weary in case it opened a trap door, or released Creepers or set fire to me or something! Then again, it could be as simple as opening a door... Taking the risk, I grasped the handle and pulled! Flinching slightly, I heard a noise to my right, and then saw a bright light and the dirt that made up the wall parted in the middle to become part of the ceiling and floor! 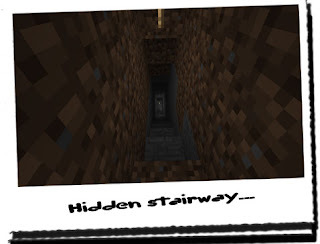 Looking to my right, I saw a small stairway leading down to a cobblestone wall! It was lit up with torches and from below came a gush of cold air! Taking the bow in hand, I began to descend the stairs... About halfway down, I become aware of a strange skittering noise... It sounded a little like a Creeper hissing, but it sounded off... Continuing round to the bottom, the corridor veered off to the right and then another right, leading back the way the stairway had come, except on a flat level. 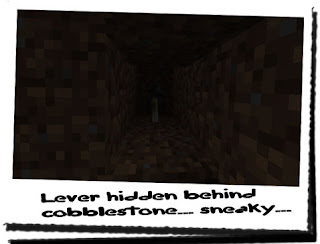 In the distance, I could see light; a few torches were visible on a wall... A mossy cobblestone wall... What was this...? The skittering noise grew louder and louder as I advanced, and I took and arrow from the quiver! Pulling it back as far as I could, I inched closer to the edge of the room... I peered inside and what I saw I couldn't believe! Another cage sat in the centre of the room with a small spider placed in the centre, on fire! The walls were all made from cobblestone, and a chest sat against the far left-hand wall! As for the source of the skittering noise, I couldn't tell, but as I was about to enter the room, a black shadow fell from the ceiling! I lunged backwards into the corridor, span around and fired an arrow into the room! I missed the black shadow that had come from above as I heard it hit the wall. 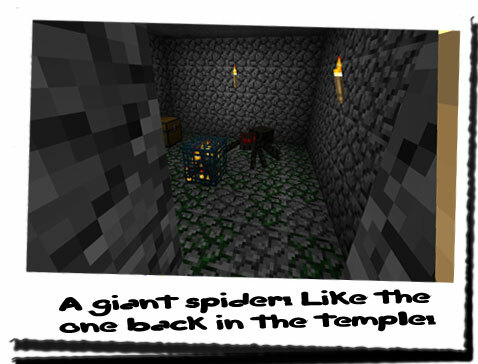 But there, sitting next to the cage... Was a giant spider! Just like the one I had seen in the temple! How was this possible?!? !